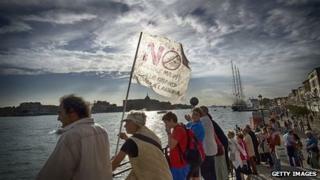 The Italian government has announced it will begin to limit the number of large cruise ships that pass through Venice. Environmentalists have protested against the ships in recent years, saying they damage the city's fragile lagoon. From January 2014, the number of cruise ships allowed through Venice will be cut by 20%. Ships of more than 96,000 tonnes will be banned from the centre of the city from November next year. Prime Minister Enrico Letta's office also announced plans to open up a new canal route to the city - thereby allowing big vessels to enter the city by a kind of back door, the BBC's Alan Johnston reports from Rome. The measures were announced after a meeting between Mr Letta, the mayor of Venice and other local politicians on Tuesday. A spokesman for those who have protested against the ships told Italian media that the measures constitute a first step and that their campaign will go on. Concerns over big ships sailing too close to shorelines have increased since the Costa Concordia cruise liner ran aground off a Tuscan island in January 2012, killing 32 people. Those who oppose the ships argue that they are grotesquely out of keeping with the beautiful old city and that they disgorge unsustainable numbers of visitors into the squares and alleyways, our correspondent reports. But there is also a powerful lobby in Venice that favours the cruise ship trade and welcomes the economic benefits it brings, he adds.